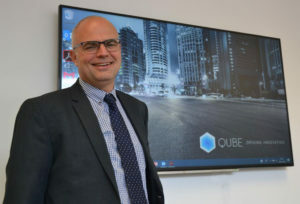 Qube – one of the UK’s leading data analysis and business reporting consultancies for the automotive industry – has recently appointed Lee Morson as IT and Business Change Manager. Lee brings more than 30 years’ experience in IT to the company, together with expertise in Project Management and delivering structured ICT programmes to support Business Change strategies. “Sophisticated Information Technology and data intelligence is central to the service Qube provides to vehicle manufacturers in the UK and mainland Europe, and Lee’s range of skills further strengthens our delivery capability, explains Qube’s co-director,” Liz Walker. Prior to joining the team at Qube, Lee worked as a Portfolio Manager for a large outsourcing company where he was responsible for the delivery of Corporate, Local and Regional Government ICT and Business Change. He is well-versed in applying industry recognised standards on both the public and private sector. “We are delighted that Lee has joined the Qube team as a Business Change Manager. His wealth of experience with over 30 years in IT project management will be invaluable in providing the highest-level service to our automotive clients as they seek to reduce costs and improve profitability across their dealer networks,” continues Liz. “With a lifelong interest for all thing automotive, I feel privileged and incredibly excited to now be working within this industry sector, with a team of passionate and dedicated subject matter experts, and at the same time providing me with the opportunity to contribute my own areas of expertise around customer engagement, business change, IT process and IT delivery,” says Lee Morson. Qube is headquartered in Maidstone, Kent. The company provides bespoke business reporting, data management and consultancy services to automotive manufacturers in the UK and mainland Europe. Drawing on more than 20 years’ experience in the automotive industry, Qube’s expert team creates detailed tracking and reporting systems which provide business-critical information and accurate KPIs. The company provides quality data intelligence, tailored to individual requirements, to give decision-makers the insight needed to improve revenue and vehicle retention.